Here are a couple from Ft Worth. Te beer was great, the Tex Mex outstanding and getting to hang out with Shyam was a treat, we went to a day long do at a craft brewery and took time to catch up. The flight to San Luis Potosi was a short hop away. The trip to the hotel was uneventful and our gracious hosts organized a bus top tour of an evening going around all the plazas followed up by a scrumptious dinner. Unfortunately, the trip was supposed to start inside the famous cathedral but entry to the cathedral was restricted due to some ceremony (wedding mass?). For the uninitiated, paved plazas connected by narrow streets are a feature of colonial Spanish towns, The center of the plazas usually feature gardens, fountains and statues. 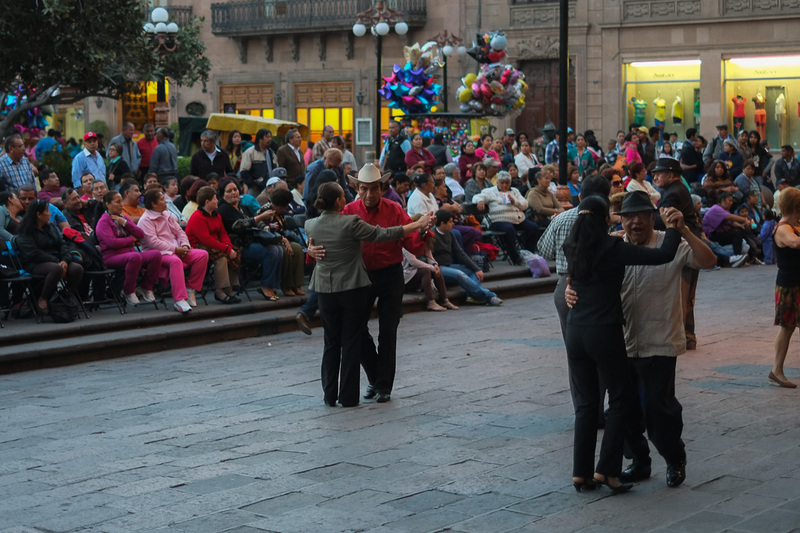 The larger plazas sport churches and cathedrals,boutique stores and bars.It is here that of an evening, the Mexican family turns out to enjoy the breeze, catch up with friends and family all while the kids play while licking an iced lolly brought from a street vendor. It is truly a great vignette of Mexican life. Here are some images from the bus tour that evening. To note here is the lack of a quick AF on the Fuji has been something I read about on forums until that point but it became apparent how big a handicap it was to me that evening, the quickly moving bus and low light contributed to great number of badly focused images. Over the weekend, I got to explore more of the city. Being brown skinned, I blended right into the crowd of Friday shoppers, dodging in an out of a steady stream of multicolor taxis and VW Beatles. This is a good point to pause and discuss the overabundance of the VW Beatle of the old design which had only earlier that year (2014!) stopped manufacturing in MX. You could walk around and fin done of every color and vintage without much effort. There was music being performed in public with the yound and the old alike enjoying their waltzes and tangos. It was great seeing a city unwind after a long hard week at work. Excitment for humans and dogs alike! After exploring SLP in this manner for a couple of days, I took the advice of the locals and took the AC bus ($40 if I remember correctly, Cheap and Clean) to Queretaro, a more charming, colonial city closer to San Miguel de Allende. The journey took about two and half hours and went through some of the most authentic Mexican scrub deserts you can find. The desert-scape dotted with little towns with colorful cantinas, old churches with older cemeteries. Queretaro takes SLP’s colonial charm and turns it up to 11 (think a Spanish colonial Sedona). The plazas are narrower, more packed and full of culture. There were performers of all stripes, bands,dancers, acrobats and clowns galore.The roads are narrow and lead to little plazitos (if I may) with statues, fountains or little roundabouts. Among the must visit places are the main plazas (I forget their names now), the old aquaduct and the narrow streets selling artwork (where I brought a delightful painting of Homer Simpson as “El Padrino”, one of my greatest finds thus far in my travels). Sadly, on the evening of my visit to Queretaro, my Nikkormat took a dive from my bag and was badly dented in the corner. The prism was also chipped. Amazingly, the lens was ok and is still a trusty favorite to this day. In Mexico, leather goods are cheap and abundant as are various little handcrafted trinkets.The food was outstanding, if you have had nothing but Tex-Mex, be prepared to have your mind blown. The beer (not Corona, Pacifico or Dos Equis) was cheap, tasty and easily available making it easy to forget the heat that lies across the cities as a warm blanket until well into the night. Everywhere I went, after the initial skepticism that I could not speak espanol, the people were welcoming, patient and accommodating. Mexico is an old country with young people (median population aged 24 years old in 2014!) embracing the old culture along with the new. I loved every moment of my time in Mexico and was reluctant to leave. I wish to return and bask in the glories of Mexico if the opportunities arise in the future.